Is e stàit Ghearmailteach a tha ann am Baden-Württemberg. Tha Stuttgart na prìomh-bhaile. 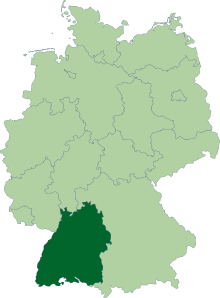 Air a tharraing à "https://gd.wikipedia.org/w/index.php?title=Baden-Württemberg&oldid=492543"
Chaidh an duilleag seo a dheasachadh 2 dhen Ghearran 2015 aig 22:32 turas mu dheireadh.